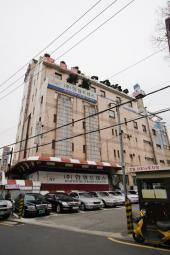 Yeongbin Hotel is located only 10 minutes walk from the so-called "sleepless city" Dongdaemun, a must-see attraction in Seoul. Subway line 2, 4, 5 Dongdaemun Stadium station is also within 5 minute walking distance. There are 36 guestrooms total with a selection of Double, Deluxe Double, Twin, Deluxe Twin rooms. Complimentary Internet access is available in Deluxe rooms. The hotel also features sauna facilities including JJ mud sweating-room (women only) on the basement level. Nearby are Dongdaemun shopping town, Shilla duty free shop for shopping sprees and diverse dining locations where guests can taste Korean dishes including Jokbal, fried fish, gamjatang and dukboki. Other nearby attractions include Jangchung Park, National Theater of Korea and Namsan Tower, all reachable by city bus.